New Smyrna Waves by Exploria Resorts is located directly on the white sands of New Smyrna Beach. This low-key seaside beach community offers all the ingredients of a relaxing family beach vacation. Featuring one and two bedroom floor plans with full-sized kitchens a vacation stay at New Smyrna Waves offers a relaxing heated swimming pool direct beach access and a convenient location. Explore the local artesian community search for manatees and dolphin or sample the areas unique shopping district and restaurants. Fishing excursions day trips to Daytona International Speedway and St. Augustine and the areas many other attractions may be arranged through the Front Desk. 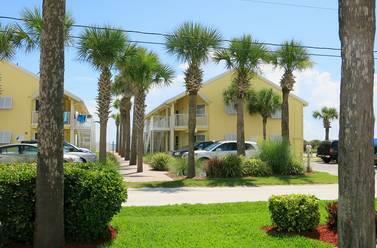 New Smyrna Waves by Exploria Resorts is located directly on the beach in beautiful New Smyrna Beach Florida. Security Deposit of USD 150.00 required at check in A credit card is required at time of booking to hold unit. Reservations must be cancelled 24 hours prior to the arrival day to avoid a penalty of one night room and tax. Exceptions may apply - please see rate rules. Water park go karts mini golf arcade laser tag and rock wall. Daytona Speedway tours races and museum. Dolphin discovery and sunset tours.Free aquarium exibits. In the New Smyrna Historic district it contains exhibits depicting the history of New Smyrna. A 175 ft tall lighthouse began operation in 1887.Historical displays and gift shop. Walking trails boardwalk fishing pier playground duck pond. Beach access boardwalk fishing nature trails picnic area. Built in the 1800s and destroyed by Indians during the second Seminole war. Shopping in Daytona Beach across from the speedway. ~16 miles from New Smyrna Beach. ~36 miles from New Smyrna Beach. ~54 miles from New Smyrna Beach. ~60 miles from New Smyrna Beach.